Recycling Rates Around the World - Planet Aid, Inc.
Americans recycle 34 percent of all the waste they create, according to the latest report from the Environmental Protection Agency. And while the U.S. recycling rate has been increasing over time—it was a mere 6.2 percent 50 years ago—there is more waste being created than ever. In total, Americans generated 254 million tons of trash in 2013, which is about 4.4 pounds per person per day. Many European countries have developed more successful recycling programs, with Austria and Germany boasting the highest recycling rates at 63 and 62 percent, respectively. Developing countries generally do not have formal recycling systems in place. It is common, however, for people to make a living salvaging recyclable materials from the trash to sell. The Zabaleen people in Egypt, for example, go door to door in Cairo collecting trash, of which they are able to recycle up to 80 percent. 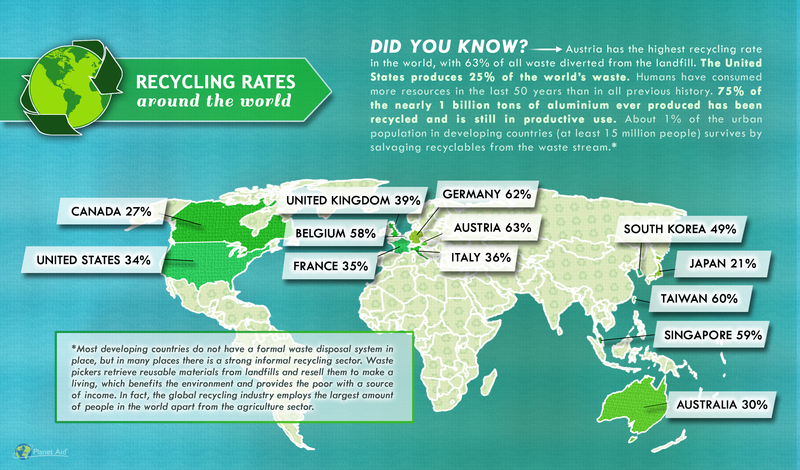 Learn more about how much countries around the world recycle in our infographic below. Click for the large version.